Generally its not necessary to go to the extremes of changing the needles out unless the operator experiences excessive thread breaks, needle breaks, or just poor quality embroidery. An embroidery machine needle is different from a regular hand or sewing embroidery needle that most are familiar with. An embroidery machine needle has a scarf on it. The scarf is the very small embedded curve on the back side of the needle, above the eye. The back side of the needle always needs to point towards the needle hook. The eye of the needle on and embroidery machine should so straight through and not be crooked. The scarf is cut into back of the needle so that the embroidery machine hook can pass as close as possible to the eye hole and grab the thread. If the scarf is not on the hook side and if the needle is not perfectly straight or the needle is not pressed all the way into the needle bar then, the hook might hit the needle or, might not be able to grab the thread. Sometimes the needle bar gets dirty, not allowing the needle to enter all the way up. With this happens, the same problems as above might also exist. Many embroidery machines have holes drilled perpendicular into the needle bar so that the operator can easily clean them out when they become dirty. Clean these holes out before calling your tech. There is debate on when to change the needles out assuming they are not broken. Most embroidery machine technicians say that if the machine is experiencing problems, a dull needle might be the issue (especially on caps). Other technicians claim even a dull needle should run on basic garments like polo shirts without problems. However, all techs will generally agree that a needle with scuffed sides does cause problems and should be replaced. Sometimes very strong thread such as polyesters can also eat away at the needle eventually causing thread breaks. 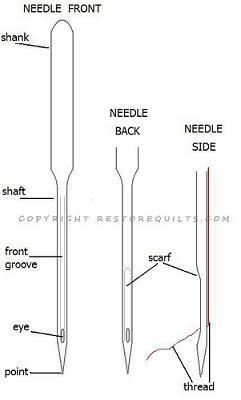 Below is a list of suggested needle sizes and needle tips to use when embroidering on different materials. This page was last modified on 5 September 2013, at 23:30.